In my opinion, this is one of Madrid’s most overlooked places. Don’t get me wrong, many locals come here, but I think people should appreciate it more. Madrid is great but has one outspoken handicap: no beach. That’s why in summer Madrid is empty, as locals flee to the coast of Spain. For example, in August it’s a ghost town, therefore during the year you must be creative & active. In my opinion, the best place to go is el pantano de San Juan (Also called the beach of Madrid), but it’s a 1.5-hour drive away. Lago is a great option to reset the concrete cabin fever just a few minutes by metro away. 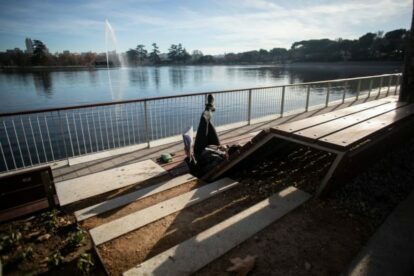 The lake is located in the middle of Casa de Campo, the biggest protected park of Madrid. Surrounded by pine trees, you’ll breathe clean air and enjoy that smooth smell of thin leaves. From here, you will see some stunning views of Madrid from a unique setting. The Kings’s Palace, Torre España and other high buildings will seem like miniatures from lago. Just beside the lake, there are many restaurants with great, but not cheap, food. You may also picnic on the metal public tables set around the lake, if you wish. In the center of the lake there’s a powerful water jet which can eject water 80 metres high. If you’re lucky, you may see people practising kayak in the lake. The best day to enjoy this would be Sunday. A great fresh escape from the city!